The goal of a test guides the selection of particular tribometer. Design of a test must include the major variables that impact friction. These include the normal force, velocity and acceleration characteristics, direction of motion relative to surface features, system stiffness, surface cleanliness and roughness, contact temperature (both ambient and that produced by frictional heating), relative humidity, lubricant properties, presence of loose particles, and more. 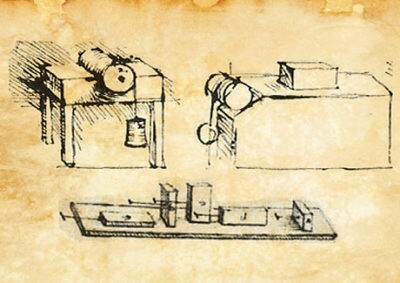 The first tribometer was invented by Leonrado da Vinci – the first tribologist . It is schematically shown in the figure below. Since tribological problems are present in almost any field of engineering, a wide range of tribometers are in use to mimic all kinds of situations encountered in the real life applications as listed below. Despite the widespread availability of commercial tribometers, researchers continue designing specific tribometers. This is needed to provide certain testing conditions, specific component simulations, or specimen dimensions that are not readily available. Pin in Disc tribometers are probably most known and extensively used devices in tribology. The tribometer consists of a stationary pin and a rotating disc. Pin is loaded by a dead weight or actively controlled systems. Pin can have different shapes, flat, triangular, or spherical. The latter case it is called ball on disc test. Schematically, the pin on disc (actually ball on disc) set up is shown in the figure below. The test is used to determine the characteristics of lubricating oils and greases in sliding applications. The test consists of rotating a ball under load against three stationary balls in lubricated conditions. Measurements are taken at the various speeds, temperatures, and duration as specified by published standards. The lubricant comparisons can be made based upon scar diameters incurred from wear tests. After the tests, the size of the scar is measured which characterizes the ability of the lubricant to prevent wear. Loads applied during wear tests, produces circular wear scar on each ball and the average wear scar diameter is determined for comparison. Wear scar diameter on the steel balls are measured using an image acquisition system. The Reciprocating Sliding Friction and Wear test can be used to measure average coefficient of friction (COF) and wear. It is possible to perform dry and lubricated tests. Different types of contact geometries are possible such as Ball-on-disc, ball-on-plate, cylinder-on-disc, cylinder-on-plate and disc-on-disc. Load, Frequency, Stroke length and Temperature can be varied according to requirements. High Frequency Reciprocating Rigs (HFRR) can be useful to perform measurements with diesels, low viscous lubricants and additives. The Falex Pin & Vee Block Test Machine is a laboratory tool for evaluating wear, friction and extreme pressure properties of materials and lubricants. A steel journal is locked in place with a brass pin. Two V-blocks surround the journal while it rotates. The blocks apply increased pressure over time. The wear on the blocks can be measured to determine how much of the block was worn away. In this apparatus a ring (‘test cup’) rotating at 800 [rpm] is pressed against a stationary slab (‘test block’) in the presence of the lubricant tested. The test is conducted for ten minutes at successively higher loads until ‘OK’ and failure loads are determined. The ‘OK’ is the highest standard load at which the spinning bearing race produces no scouring mark on the test block, but only a uniform wear scar. High Temperature Tribometers are used for analysis of friction and wear properties at elevated temperatures, as high as 1200-1500oC. This kind of tribometers generally use a furnace or insulated chamber equipped with heating coils to obtain high temperatures. See the video below. Low temperature Tribometer are used for analysis of friction and wear properties of materials at very low temperatures 0 to -120oC. These are generally used for testing materials used in space applications or for very low temperature regions (pipelines in polar regions eg. Siberia). These kind of tribometers generally use liquid nitrogen or liquid helium to cool the interface. Vacuum Tribometer are designed to provide controlled vacuum conditions (10E-7 mbar) for friction and wear studies. Some of the tribometers are equipped with heating devices to perform tests at high temperature. These devices are needed to test critical equipment with moving parts that work under cryogenic and/or vacuum conditions (machines operating in harsh conditions, such as space, tools in the semiconductor industry, scanning electron microscopy or cryo pumps, etc.). Used to investigate tribological properties of a wide range of surfaces and interactions at small scales (atomic level). Typically the applied forces are small, leading to small friction forces which are difficult to measure. Specific devices are needed to perform such tests. Scratch test instrument is a simple for evaluating adherence characterization and scratch resistance for thin coatings and bulk materials. A stylus with well-defined tip geometry is moved over a specimen surface with load until failure occurs at critical load or loads. It also can be combined with inline profile characterization. Taber Abraser test is used for measuring the abrasive wear resistance of a material. Test specimens are cut in shape of a disc. Then the specimens are placed on the turn-table and are subjected to rubbing action of a pair of rotating abrasive wheels at known weights. Air jet erosion tester is used to test materials, coatings, surface treated parts under erosive environment/conditions. The test sample is subjected to a high speed stream of abrasive particulate gas for a certain duration and after test completion, the sample is checked for wear. The result of the test is reported as the loss of weight of the sample. Water/Slurry Jet Erosion Test is similar to the air jet erosion test, but instead of air, water/slurry jet is used. Used to test tribocorosion. Reciprocating tribometers are modified and are incorporated with electrochemical test set-up to study of the simultaneous action of sliding and corrosion. Fretting is a specific wear type which is characterized by low amplitude oscillating sliding between bodies, which are nominally at rest  (for example due to vibration, cyclic stresses, etc). The amplitude of sliding may vary from tens of mircons (in bolted joints, electrical contacts) to tens of nanometers (in MEMS). Fretting tribometers are therefore specific machines designed for low amplitude reciprocating motion. Bio Tribometers are used to mimic situations encountered in biological environments such as artificial joint replacements. Behavior of the materials used in these devices can be tested (in accelerated manner) with such tribometers. Materials like UHMWPE, Al2O3, Polycarbonate urethanes (PCU),Ti-6Al-4V are used to replace acetabular cup, femur head, meniscus and tibia (epiphysis), respectively. Lubricant materials like hydrogels based phospholipids and animal derived hyaluronic acids are used as injectable lubricant supplements for knee and hip joints. Dry sand rubber/wheel abrasion test is one of the most widely used abrasion testing method. 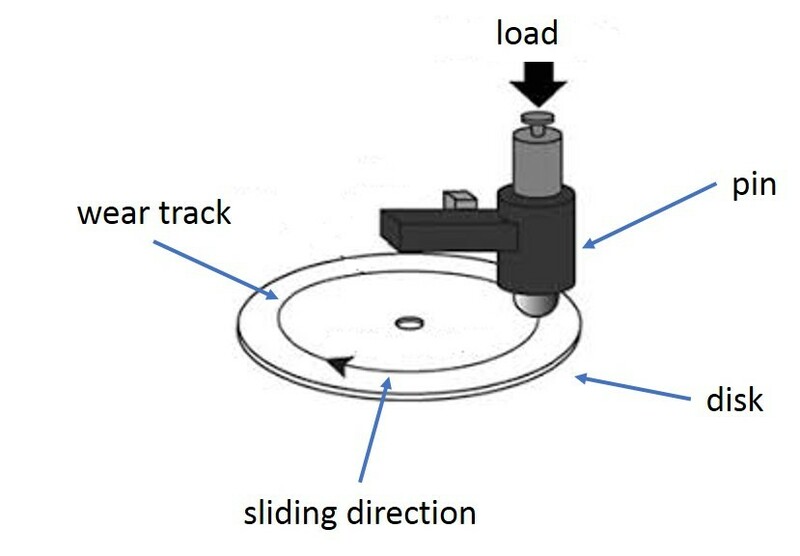 Low-stress scratching abrasion is simulated in the test by trapping a stream of free-falling abrasives between a wear specimen and a rotating rubber coated wheel. The wear is usually determined by weight loss. A wide range of materials can be tested for example; metals, ceramics, plastics, composite materials and coatings. Friction science and technology, P. Blau. Bhushan, Bharat. “Chapter 12: Friction and Wear Screening Test Methods.” Springer Handbook of Nanotechnology. Berlin: Springer, 2006.